Lime or Lemon? : Is food turning into soap? In the last century the soap did usually not bring along thoughts about food. The fragrances of the washing products were often flowery – roses, lilacs, water lillies. About a decade or two ago some food ingredients like apple, almond, vanilla, mint, olives, citruses found their place in the shampoos, shower gels and creams. Also some geographic relevance has been and still is widely used by the soap industry. Examples are Florida Sunshine, Japanese Cherry Blossom, Morrocan Rose. And why not an Estonian Spruce or Estonian Forest Dew shower gel as 50% of the country is covered with trees? I walked into a store to buy some shower gel and was rather astonished looking at the choice I had. Hmmm, cucumber and mint, watermelon and eucalyptus, lemon and thyme, fig and rosemary, pear and lemongrass, apricot and basil….most of them I use in my food, not necessarily in these combinations, but all relevant for savoury or sweet dishes. The products actually contain the extracts of these ingredients. I ended up buying a Cucumber and Mint as well as a Lemon and Tthyme. What makes the food now so strong in the choice of the body products? Do they want me to become hungry, are they playing on the association of the ingredients triggering a feeling of satisfaction or perhaps craving? By now my mind was hooked on why are the food ingredients so dominant also in the soap manufacturing. I visited more stores and found that the most popular seem to be the citruses: grapefruit and bambus, citrus and melisse, lime, sweet lemon, etc. Sometimes a catchy name is achieved through alliteration like Vitalising Vitamins or Paradisiac Pink Pepperpod, even a triple one, the latter. The funniest shower gels that caught my eye that day were a Mojito shower gel from foods and Energizing Seamoss from non-foods. By chance I had cucumber, mint, lemon and thyme at home and I actually tried both combinations. 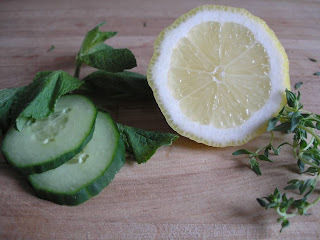 Not so sure about the cucumber and mint, but the lemon and thyme are nice, I have had it with some white fish before. This trend is either all an advertising trick on the unconscious or we are moving towards the era when the food nutrients can be obtained by the immersion through the skin, a way to fight obesity but I doubt that it would satisfy the hunger to experience the actual taste in your mouth.